Imene Rigueur is the newest midwife at Maison de Naissance, and she often works the night shift. Fortunately, she was well prepared to practice her midwifery skills on the night of Oct 11th through the morning of Oct 12th. That night, four babies were delivered, with the last one coming in the early hours of the morning. He was a two month premature boy, who only weighed two and half pounds. Imene noticed immediately that he was not crying, moving, or even breathing. He did have a heartbeat, so she set about the business of getting him to breathe, assisted by nurse Gerline Cesar and Midwife Supervisor Beatrice Lotin. First, they made sure he was warm, and then massaged him to stimulate a response. When this did not succeed, Imene’s training from “Helping Babies Breathe” kicked in, and she began resuscitation procedures. 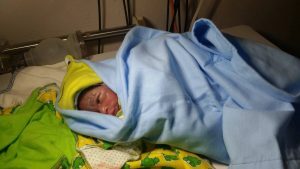 As Imene worked, she realized no one else in the delivery room thought the baby could be revived, but that only hardened her resolve to save his life. 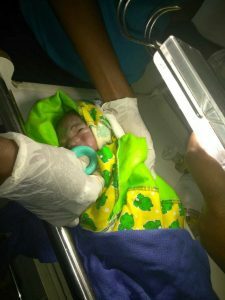 She continued her efforts to resuscitate the baby boy for nearly 80 minutes, with continuous progress, until eventually he was breathing on his own, safely. Once he had been fed by his mother, they were sent to the local hospital for a follow up pediatric exam, to ensure there were no other complications. The mother and baby were released the next day to go home. 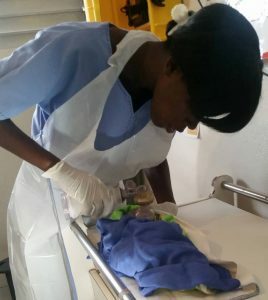 Afterward, Imene said knowing she was the only one who had hope for that tiny baby gave her the strength to keep going, and she was determined to save his life. She said this success made her very happy, and will motivate her to always remain positive, even when others give up hope.